The aircraft was 46 minutes into a scheduled flight from Nassau, Bahamas, to Orlando, Florida. The airplane was being controlled by the autopilot at about 18,000 feet when they encountered instrument meteorological conditions that rapidly led to the windscreen being covered by a layer of ice. The crew turned ice protection systems on and the ice on the windshield was cleared. The first officer observed ice on the right wing's boots and the right prop's spinner that extended farther back than he had previously experienced. The first officer then switched the ice protection systems to their highest settings. De airspeed then decreased from 1750 to 160 kts.The captain disconnected the autopilot, applied power, and initiated nose down pitch inputs to arrest the airspeed loss. They indicated that these actions were unsuccessful and the speed further deteriorated to about 130 knots at which point the airplane rolled about 90 degrees to the left, and then back to near level. In the next 24 seconds, the airplane again rolled about 110 degrees to the left, back to level, then about 120 degrees to the right, back to level, and then rolled 360 degrees to the right, back to near wings level. Since the crew reported trouble with the flight attitude instruments, the roll angles recorded on the FDR are being further investigated. The maximum nose down pitch attitude was 60 degrees, the maximum recorded airspeed was about 240 kias, and maximum vertical acceleration during recovery was about +3.6 g. The crew immediately diverted to West Palm Beach and landed there 12 minutes after the upset. 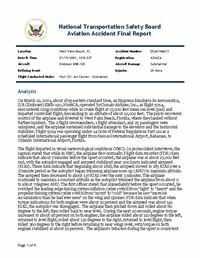 PROBABLE CAUSE: "The failure of the flight crew to maintain airspeed during an encounter with severe icing conditions, which resulted in an inadvertent stall, loss of control, and structural damage to the airplane." Distance from Nassau International Airport to Orlando International Airport, FL as the crow flies is 533 km (333 miles).